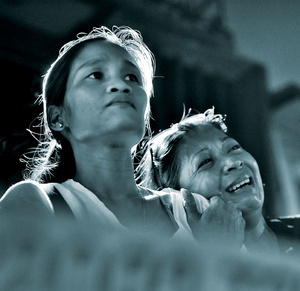 Relatives mourn a person killed by Manila police for alleged drug involvement. Police found the child’s lifeless body strewn grotesquely on a tombstone, in a public cemetery near her home in Malabon – a city in northern Metro Manila – on a warm October morning. Police informed her father – Roberto Ramos – that a drug addict had raped and killed his seven-year-old daughter the night before, while the world was asleep and there was nobody but the dead to bear witness. The stories of crimes committed by drug users are as varied as they are endless. Philippine president Rodrigo Duterte has not hesitated to use these stories to justify his controversial war on drugs. He promised in one of his campaign speeches that ‘it will be bloody’. And it has been. Duterte became the country’s 16th president last June. He won on an anti-crime platform, with a record-breaking 16 million votes. By early December, his crackdown on drug users and pushers had left at least 4,800 people dead – roughly 30 deaths a day. Photographers assigned to cover the night beat attest that the victims are either killed vigilante-style or shot dead by police in drug raids. The Network Against Killings in the Philippines, a coalition of human rights groups, has condemned Duterte’s pronouncements ‘in the strongest terms possible’. UN Special Rapporteur on Extrajudicial, Summary or Arbitrary Executions, Agnes Callamard, is set to investigate on a visit to the country in early 2017. Meanwhile, the killings continue in the dead of night, leaving behind a trail of bloodied corpses.